Allen and Co.’s annual conference of technology, media and business moguls kicks off bright and early today, July 9, at Sun Valley Resort. Attendees are expected to stay in the Sun Valley Lodge, Sun Valley Inn and surrounding cottages. Numerous participants arrived Tuesday for conference registration and an evening wagon ride to Trail Creek Cabin for a barbecue dinner. The conference, with a guest list including hundreds of the world’s best and brightest, consists of a four-day schedule of meetings and forums interspersed with recreation and entertainment. The conference—hosted by the specialty investment firm from New York City that gave it its name—is now in its 30th year. Allen and Co. coordinators have contracts with multiple local businesses and residents to ensure that guests are treated to complete luxury and cultural flair. With forums on a myriad of topics, including education, leadership, media and public service, the conference will not only be attended by tech giants and investors—the guest list also includes big-time sports figures, politicians and journalists. Secretary of State John Kerry will be interviewed Friday by journalist Charlie Rose of the “Charlie Rose Show.” The politician and onetime presidential hopeful owns a second home in the Wood River Valley. David Ignatius, associate editor of The Washington Post, will be present along with longtime New Yorker magazine reporters Evan Osnos and Ken Auletta. For a conference adverse to media coverage, Allen and Co. invites its share of journalism pioneers. New Jersey Gov. Chris Christie is expected to attend, along with Marissa Mayer of Yahoo and Bud Selig, Major League Baseball commissioner. Big names in the American sports world customarily attend—the conference opens with a discussion on content and communication featuring former NFL coach Bill Cowher of “The NFL Today,” Phil Jackson of the New York Knicks and Tony LaRussa of the Arizona Diamondbacks. The final forum on Saturday will reportedly be an interview of billionaire investor Warren Buffett and Amazon founder and CEO Jeff Bezos by a reporter from CNBC. The meetings only last a few hours, with the attendees invited to partake in a variety of outdoor activities in between. Wagon rides, hiking, whitewater rafting and fitness classes are part of the conference schedule. There are also classes for those who may be less physically inclined: sketching, beading and knitting are also on the agenda. Families of guests often attend and partake in the variety of events available. 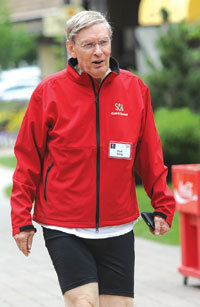 Despite an ongoing large-scale renovation, Sun Valley Resort will be the home base for Allen and Co., as is tradition. Meals are to be served in the Limelight Room and throughout the Lodge grounds, with an off-site dinner Thursday. The weekend comes to its traditional end with the Sun Valley Ice Show next to the resort at dusk on Saturday. That event is open to the public.